Hello again! I was completely overwhelmed this week from all the support shown by the #warmongers twitter community. 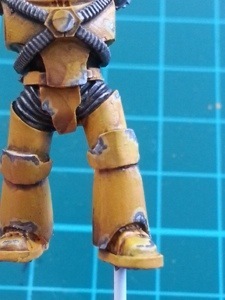 After posting some pictures of my new Imperial Fists, a few of you guys asked how I painted the battle damage on the figures, so I’ve decided to write up a little tutorial. I spent a few weeks scouring the internet to find the method I’ve used here. Any questions, leave me a comment, thanks. After undercoating the model with Citadel white primer, I painted on two layers of GW Yriel yellow, thinned with water to give a nice even coat. Next, I chose areas of the armour which I thought would receive the most wear, usually the edges of plate such as the lower greaves and elbow guards. 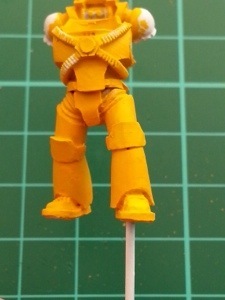 I then added Ceramite white to the Yriel yellow to create a colour to mimic undercoat on the armour itself. 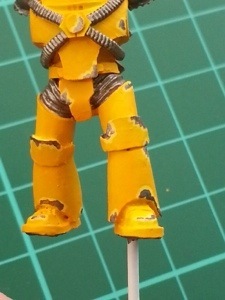 Once dry, paint Leadbelcher into the “primer” leaving an outline of the primer colour showing around the edges. For the next stage, I washed the whole figure in a 50/50 mix of Devlan mud/Nuln oil mix, thinned with water so it was not too strong. And that’s more or less it really. 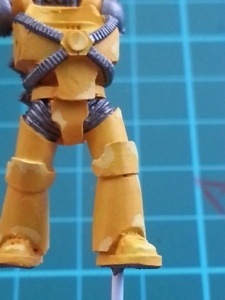 On some areas of battle damage I add a further highlight of Chainmail on the very edges. I think overall it works well for the figures I’ve painted. It’s also very a quick method of painting and I need to get through about 40 of these in the next three weeks. Hope you find this useful, and I’ll be along with more updates soon, cheers! Previous Previous post: A little headway. Next Next post: Phase 1 almost complete! Thanks for taking the time to look bud. Let me know how you get on.